He was born in Brooklyn, New York, and as a child was afflicted with a congenital heart disease that doctors said would kill him before he reached the age of thirty. After graduating high school he worked as a store clerk during the day and to gain some job skills took a night class in typing. He then found work as a secretary with Universal Studios' New York office, and was later made studio manager for their Los Angeles facility. There, he oversaw production of a hundred films during his three years with the company. Among the films he produced was The Hunchback of Notre Dame. In Los Angeles, he partnered with Louis B. Mayer's new studio and, after it merged with two other studios, helped create Metro-Goldwyn-Mayer (MGM). He was made head of production of MGM in 1925, at the age of twenty-six, helping MGM become the most successful studio in Hollywood. During his twelve years with MGM, until his early death at age 37, he produced four hundred films, most of which bore his imprint and innovations, including story conferences with writers, sneak previews to gain early feedback, and extensive re-shooting of scenes to improve the film. In addition, he introduced horror films to audiences and coauthored the "Production Code," guidelines for morality followed by all studios. During the 1920s and 1930s, he synthesized and merged the world of stage drama and literary classics with Hollywood films. Thalberg created numerous new stars and groomed their screen images. Among them were Lon Chaney, Ramon Novarro, John Gilbert, Joan Crawford, Clark Gable, Jean Harlow, Wallace Beery, Luise Rainer, Greta Garbo, Lionel Barrymore, and Norma Shearer, who became his wife. He had the ability to combine quality with commercial success, and was credited with bringing his artistic aspirations in line with the demands of audiences. After his death, Hollywood's producers said he had been the world's "foremost figure in motion-picture history." President Roosevelt wrote, "The world of art is poorer with the passing of Irving Thalberg. His high ideals, insight and imagination went into the production of his masterpieces." The Irving G. Thalberg Memorial Award, given out periodically by the Academy of Motion Picture Arts and Sciences since 1937, has been awarded to producers whose body of work reflected consistently high quality films. Situation Wanted: Secretary, stenographer, Spanish, English, high school education, no experience; $15. He found work as an office secretary at Universal Pictures' New York office, and later became personal secretary to the studio's founder and president, Carl Laemmle. Among Thalberg's duties were transcribing and editing notes that Laemmle had written during screenings of his films. He earned $25 weekly, becoming adept at making insightful observations, which impressed Laemmle. In describing the rationale for this early appointment as studio manager, film historian David Thomson writes that his new job "owed nothing to nepotism, private wealth, or experience in the film industry." He reasons that despite "Thalberg's youth, modest education, and frail appearance ... it is clear that he had the charm, insight, and ability, or the appearance of it, to captivate the film world." The cost of that set alone had staggered Thalberg when he learned of it, but it was von Stroheim's obsessive spending on unnecessary detail that finally led to Thalberg's confrontation with the formidable director. Thalberg quietly explained that the director worked under the producer, and it was his responsibility to control costs. Von Stroheim, surrounded by his assistants, then confronted Thalberg: "If you were not my superior, I would smash you in the face." Thalberg, unflinching, said "Don't let that stop you. ":32 The result was that Thalberg soon after removed the cameras from von Stroheim's studio and took over editing. The uncut footage was pared down from five-and-a-half hours to three hours, to von Stroheim's deep dissatisfaction. His youth also contributed to his open-mindedness to the ideas of others. Conrad Nagel, who starred in numerous Thalberg films, notes that Thalberg was generally empathetic to those he worked alongside: "Thalberg never raised his voice. He just looked into your eyes, spoke softly, and after a few minutes he cast a spell on you. ":74 Studio attorney Edwin Loeb, who also worked to create AMPAS, explained that "the real foundation of Irving's success was his ability to look at life through the eyes of any given person. He had a gift of empathy, and almost complete perspective. ":74 Those opinions were also shared by producer Walter Wanger: "You thought that you were talking to an Indian savant. He could cast a spell on anybody." His talent as a producer was enhanced by his "near-miraculous" powers of concentration, notes film critic J. Hoberman. As a result, he was never bored or tired, and supplemented his spare time with reading for his own amusement, recalls screenwriter Bayard Veiller, with some of his favorite authors being Francis Bacon, Epictetus, and Immanuel Kant. Although their personalities were in many ways opposite, Mayer being more outspoken and nearly twice the younger man's age, Thalberg was hired as vice president in charge of production at Louis B. Mayer Productions. Years later, Mayer's daughter, Irene Mayer Selznick, recalled that "it was hard to believe anyone that boyish could be so important. ":47 According to Flamini, Thalberg was hired because, although Mayer was an astute businessman, "what he lacked was Thalberg's almost unerring ability to combine quality with commercial success, to bring artistic aspiration in line with the demands of the box office. ":47 Mayer's company subsequently merged with two others to become Metro-Goldwyn-Mayer (MGM), with the 24-year-old Thalberg made part-owner and accorded the same position as vice president in charge of production. Three years after the merger, MGM became the most successful studio in Hollywood. I'd like to open this sequence on a roaring gale at sea. ... I think it might be better to open just prior to the storm—that awful calm before the storm ... and the typhoon hits and they go through all that hell, and the terrific tiredness after the fight is over—the weariness of Gaskell [Clark Gable], and from behind him this China woman comes and their affair [begins]. A temperate man in all his ways of living, in this one respect he was an inveterate gambler. If he believed in a man, or a project, or a story, he would stake everything on his conviction. ... Everyone who worked for Thalberg loved him. He had the quality, rare among showmen, and precious among men, of standing back after an achievement and letting the other fellow take the credit ... he never wanted to be known as the big promoter. He just saw a little farther than most of the others, and trusted his vision, and worked like a laborer until it came true. ... What he also had was a great kindliness, a love for his work, workers, friends and audiences. Thalberg went against consensus and took another risk with The Great Ziegfeld (1936), costarring Luise Rainer. Although Louis B. Mayer did not want her in the role, which he felt was too minor for a new star, Thalberg felt that "only she could play the part", notes biographer Charles Higham. :240 Shortly after shooting began in late 1935, doubts of Rainer's acting ability emerged in the press. However, despite her limited appearances in the film, Rainer "so impressed audiences with one highly emotional scene" that she won the Academy Award for Best Actress. After her winning role in The Great Ziegfeld, Thalberg wanted her to play a role that was the opposite of her previous character, for The Good Earth (1937). For the part as a Chinese peasant, she was required to act totally subservient to her husband, being perpetually huddled in submission, and barely spoke a word of dialogue during the entire film. Rainer recalls that Mayer did not approve of the film being produced or her part in it: "He was horrified at Irving Thalberg's insistence for me to play O-lan, the poor uncomely little Chinese peasant. ":142 However, she again won the Oscar for Best Actress, becoming the first actress to win two consecutive Oscars, a feat not matched until Katharine Hepburn's two Oscar wins thirty years later. Luise Rainer, under his guidance, became the first star to win two consecutive Academy Awards as Best Actress. After Thalberg's sudden death during production of The Good Earth (1937), her film career went into decline from being given a string of bad parts, and she gave up her film career. Rainer commented years later, "His dying was a terrible shock to us. He was young and ever so able. Had it not been that he died, I think I may have stayed much longer in films." In 1925, a young Greta Garbo, then twenty, and unable to speak any English, was brought over from Sweden at Mayer's request, as he saw how she looked in still photos. A Swedish friend thought he would help her by contacting Thalberg, who then agreed to give her a screen test. According to author Frederick Sands, "the result of the test was electrifying." Thalberg was impressed and began grooming the new starlet the following day: "the studio arranged to fix her teeth, made sure she lost weight, and gave her an English tutor." Joan Crawford's first role was a Thalberg production at MGM and she became one of their leading stars for the next thirty years. She felt that his contribution to MGM was vital to the film industry. Not long after his early death, she recalls her concerns: "Thalberg was dead and the concept of the quality 'big' picture pretty much went out the window." By 1932, shortly before she died, Dressler was the country's number one box office star. One of the first pictures he took charge of, Ben-Hur: A Tale of the Christ, was inherited and already in production by another studio when MGM was formed. The film was turning into a disastrous expense with cost overruns already in the millions due to its lavish sets and location shooting in Rome. Most studio executives chose to terminate the film to cut their losses. Thalberg, however, felt differently, and thought the film would affect movie audiences, due to its classic literary source, and would highlight MGM as a major new studio. Mutiny on the Bounty was the studio's next most expensive film after Ben Hur, with some now calling it "Thalberg's masterpiece." He initially had difficulty convincing Mayer that he could make the film without making heroes of the mutineers. He achieved that by instead making a hero of the British Royal Navy, whereby the officers and shipmates would from then on display their mutual respect. Thalberg also had to convince Clark Gable to accept the role against his will. He pleaded with Gable, eventually promising him that "If it isn't one of your greatest successes, I'll never ask you again to play a part you don't want." The film's other main stars were Charles Laughton and Franchot Tone. The film was nominated for six Academy Awards, including Best Actor, and winning it for Best Picture. Thalberg accepted the award as producer from Frank Capra. Mr. Thalberg had a heavy attack of influenza that lasted several days and, although he was quite ill, he recovered nicely. However, he is far from being in good condition, he is all tired out and needs rest. I want him to take a rest for several weeks. I do not consider it necessary, at this time, to send him away, as he is quite comfortable at home. Asked about the report that Thalberg had suffered a violent heart attack, Dr. Newmark replied: "Mr. Thalberg's heart has not been any too strong and that is another reason why I have insisted that he take a long rest. Once Thalberg recovered sufficiently from his bout with the "flu" and was able to return to work later in 1933, it was as one of MGM's unit producers, albeit one who had first choice on projects as well as preferential access to all the studio's resources, most notably its stars. Thalberg's close relationship to Nicholas Schenck, then president of Loew's Incorporated, proved to be an ongoing advantage for him. Loew's was the corporate parent of MGM, so Schenck was the true power and ultimate arbiter at the studio; and he usually supported Thalberg's decisions and continued to do so whenever disagreements about projects or production needs arose. 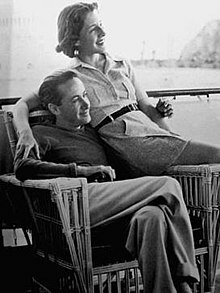 As a result, Thalberg also continued to produce or coproduce some of MGM's most prestigious and critically acclaimed ventures in this period, such as The Barretts of Wimpole Street starring his wife Norma Shearer (1934), Mutiny on the Bounty (1935), China Seas (1935), A Night at the Opera (1935), San Francisco (1936), and Romeo and Juliet (1936). Thalberg, aware of Mayer's feelings, made it a point of never giving too much attention to his daughters at social events. One of Thalberg's traits was his ability to work long hours into the night with little sign of fatigue. According to Vieira, Thalberg believed that as long as his mind was active in his work and he was not bored, he would not feel tired. Thalberg, who often got by with only five hours of sleep, felt that most people could get by with less than they realized. :74 To keep his mental faculties at peak, he would read philosophical books by Bacon, Epictetus, or Kant. "They stimulate me. I'd drop out of sight in no time if I didn't read and keep up with current thought—and the philosophers are brain sharpeners." 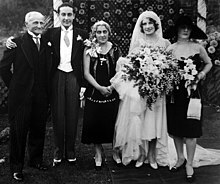 Thalberg's wedding in 1927 to Norma Shearer, with his parents and her mother shown. 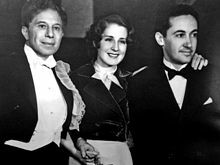 Thalberg began dating actress Norma Shearer a few years after he joined MGM. Following her conversion to Judaism, they married on Thursday, September 29, 1927, in a private ceremony in the garden of his rented house in Beverly Hills. Rabbi Edgar F. Magnin officiated at the event, with Shearer's brother, Douglas Shearer, giving the bride away, and Louis B. Mayer serving as best man. The couple drove to Monterey for their honeymoon and then moved into their newly constructed home in Beverly Hills. After their second child was born, Shearer considered retiring from films, but Thalberg convinced her to continue acting, saying he could find her good roles. She went on to be one of MGM's biggest stars of the 1930s. Their two children were Irving Jr. (1930–1987) and Katherine (1935–2006). Besides, Thalberg told Mayer, "[n]o Civil War picture ever made a nickel". Shortly after returning from Monterey, Thalberg was diagnosed with pneumonia. His condition worsened steadily and he eventually required an oxygen tent at home. He died the following morning at the age of 37. His funeral took place two days later, and when the services began the other studios throughout Hollywood observed five minutes of silence. Producer Sam Goldwyn "wept uncontrollably for two days" and was unable to regain his composure enough to attend. :293 The MGM studio closed for that day. 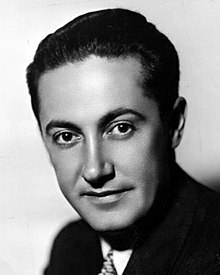 The passing of Irving Thalberg is the greatest conceivable loss to the motion-picture industry, and I say that absolutely without qualification. There are hundreds of executives but only about six men with the genuine genius for making motion pictures and Mr. Thalberg was the greatest of those. I have long considered him the most competent and inspired producer in the business. Thalberg is buried in a private marble tomb in the Great Mausoleum at Forest Lawn Memorial Park in Glendale, California, lying at rest beside his wife Norma Shearer Arrouge (Thalberg's crypt was engraved "My Sweetheart Forever" by Shearer). One of the greatest friends a man could have; one of the greatest creative minds the world has ever produced; the greatest leader our industry has ever had. No words can express either my own personal grief, nor the grief that I know all of us who owe so much to him can express. I can think of no one in our industry who does not owe Irving Thalberg a deep debt of gratitude. I can think of no one in the world to whom his passing is not a loss. In 1938, the new multimillion-dollar MGM administration building in Culver City was named for Thalberg. The Irving G. Thalberg Memorial Award, presented by the Academy of Motion Picture Arts and Sciences, also named for him, awards producers for consistently high production achievements. Nurturing a heroic sense of American character, he found his essential American figure in his last novel. ... So thorough was Fitzgerald's identification with his hero that Stahr stands among the most compelling Jewish characters in American fiction. Although parallels between Monroe Stahr in the novel and Thalberg were evident, many who knew Thalberg intimately stated that they did not see similarities in their personalities. :13 Norma Shearer said that the Stahr character was not at all like her former husband. Stahr is special, unique, monastic, a relic. He walks alone. Occasionally men follow him waiting for orders. He is in a daze of work and thought. He carries the whole studio operation in his head. In the 2016 television series based on the novel, Monroe Stahr is played by Matt Bomer. Fitzgerald also based his short story "Crazy Sunday," originally published in the October 1932 issue of American Mercury, on an incident he witnessed at a party thrown by Thalberg and Shearer. The story is included in Fitzgerald's collection Taps at Reveille (1935). Thalberg was portrayed in the movie Man of a Thousand Faces (1957) by Robert Evans, who appropriately enough went on to become a studio head himself. Thalberg was portrayed by Bill Cusack in Young Indiana Jones and the Hollywood Follies (1994), a TV film based on The Young Indiana Jones Chronicles, in which Indiana Jones is depicted as taking part in Thalberg's conflict with Erich von Stroheim over Foolish Wives. ^ Feeley, Kathleen A.. "Irving Thalberg." In Immigrant Entrepreneurship: German-American Business Biographies, 1720 to the Present, vol. 4, edited by Jeffrey Fear. German Historical Institute. Last modified August 28, 2014. ^ a b c d "I. G. Thalberg Dies, Film Producer, 37. 'Boy Wonder' of Hollywood Was Called Most Brilliant Figure in His Field". New York Times. September 15, 1936. ^ a b c Friedrich, Otto (1997). City of Nets: A Portrait of Hollywood in 1940s (reprint ed.). Berkeley and Los Angeles: University of California Press. pp. 16–17. ISBN 0520209494. ^ "Mutiny on the Bounty wins the 1935 Academy Award for Best Picture"
^ "'Thalberg Needs Rest,' Declares His Physician", The Hollywood Reporter (Los Angeles, California), January 5, 1933, pages 1-2. Internet Archive, San Francisco, California. Retrieved August 20, 2018. ^ a b Lambert, Gavin (1990). Norma Shearer: A Biography. New York: Knopf, 1990; pp. 321–325. ISBN 978-0-394-55158-6. ^ a b “Thalberg-Shearer Nuptials”, The Film Daily (New York, N.Y.), September 30, 1927, p. 2, col. 4. Internet Archive, San Francisco, California. Retrieved August 21, 2018. ^ Schatz, Thomas (1988). The Genius of the System: Hollywood Filmmaking in the Studio Era. Pantheon Books, New York, 1988. Wikimedia Commons has media related to Irving Thalberg.